There is a great difference between the spiritual and the purely material and mental view of life. The spiritual view of life holds that the mind, life, body are man’s means and not his aims, his outer instrumental self and not his whole being. It sees the infinite behind all things finite and adjudges the value of the finite by higher infinite values towards which they are always trying to arrive. It sees a greater infinite reality within man and in the world, and holds that to be of the highest importance. It seeks the emergence of that infinite in the blossoming and perfection of spiritual individuality and through that in the life of humanity. It perceives an evolutionary process by which that infinite is progressively unfolding and manifesting itself in matter, life, mind and beyond. The spiritual individual in life strives to realize the power of that infinity in his own being; to exceed the limits imposed by social convention and egoistic values; to express that power in all fields and aspects of outer life for the out-flowering of humanity; and through it, to find his unity with his fellows. Its ultimate aim is an infinite abundance, an infinite fulfillment and perfect perfection of life. One process of creation governs all human accomplishment - business and career success, personal life, artistic creativity and intellectual discovery, romantic fulfilment, personal growth and spiritual experience. All are expressions of a single process -- a process of creation by and in consciousness. Sri Aurobindo and The Mother have enunciated all the principles, stages and strategies for applying this process in any field. Whatever the field, highest achievement is possible for those who consciously apply this process in their own lives. More on Process of Creation. If Sri Aurobindo is an ocean of peace, Mother is an eternal spring of sweetness. But She loves to call Herself a Force in action endeavouring to evolve the next species. Sri Aurobindo succeeded in bringing the Supramental golden light into his very physical body in 1950. All his life he was working for this Force to come down on earth to abolish suffering and death and evolve the first member of the next species. Mother offers to all those who sincerely aspire a touch of this Force if they come forward to give an opening to the Divine Touch. She assures us of the Presence of the Force that descended in 1956 and invites us to take a leap forward in the evolutionary march. To know the Mother is to know the Divine; to let Her Force work in you is to evolve. Her sweetness, which is the sweetness of the psychic, invades our nerves when we call Her into our being. Man has been searching from the beginning of his existence on earth. What is he searching for? Is it not for freedom from the immediate fetters, is it not for mastery over his environment, is it not for knowledge of events and things? The mystic calls it God; the rationalist calls it knowledge. These two ideas combine in a very simple term of infinity, which, in initial stages, might have meant more of freedom, knowledge and longer life. The power to discover infinity of matter lies in man's mind. The capacity to make mind's ideas infinitely real lies in matter. It is in this sense that man is the ultimate resource. To discover that man is the ultimate resource, we need a theory of creation, at least a theory of social creation. Sri Aurobindo has constructed The Life Divine on this thought. "The Life Divine is the horoscope of the universe"
Introduction to The Life Divine. The Society has published a wide range of books and articles on personal accomplishment, psychological growth and spirituality in life and other topics in English and Tamil. MSS also publishes a monthly Tamil journal Malarndha Jeevayam on spirituality and prosperity. 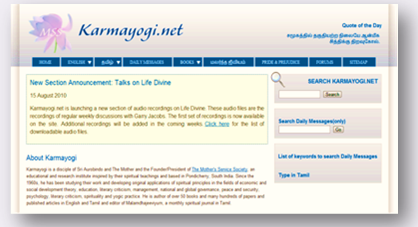 Most of the books and back issues of the journal can be downloaded from www.karmayogi.net. Attitudes are based on values. Values are the foundation of personality. The higher and wider the values you embrace and express in your life, the more your personality expands. Aspiration, courage, creativity, expansiveness, equanimity, faith, freedom, humility, generosity, goodwill, harmony, patience, perfection, perseverance, self-giving and truthfulness are high spiritual values that expand the personality and create the greatest capacity for accomplishment. When you elevate your values to expand your personality, ultimate determinant of your accomplishment can be only the limits of your aspiration and in your belief in what is possible. Spiritual progress is the ultimate goal which any individual can choose to pursue. It is also the most difficult, because it requires us to give up our normal and habitual way of functioning and acquire a higher way of functioning which is supra-normal. In the words of The Mother, those who want to seriously pursue spiritual progress should make it not just one of the aims of their life, but the only aim. The progress that enhances the presence and expression of any or all of these spiritual values in the personality and life of a person may be regarded as forms of spiritual progress. Human personalities can be examined and differentiated on six core dimensions: Energy, Direction, Values, Depth, Consciousness & Strength. These six dimensions combine and interact with one another in complex ways to form the web and woof of human personality. Think of human personality as a point or small three dimension object in space. Our trajectory for growth is to expand from that point in multiple dimensions to become a sphere. The point is present level of personality formation with limited knowledge, capacity, power and enjoyment. The sphere is our greater, true being which is potentially as vast as the whole universe and infinite in knowledge, capacity, power and joy. More on Dimensions of Personality. The first level of personal growth involves growth in our external behavior. The second level of personal growth requires a psychological change in our attitudes and values. Psychological growth refers to a qualitative change in the nature of the personality that can be brought about by conscious intention and effort. This psychological change also enhances our capacity for social accomplishment, but it does so by expanding the personality, not just by greater external effort. Psychological growth may also be described as a qualitative improvement in those attributes that make an individual what can be regarded as a 'better' and more enlightened person, expressing higher values and capable of making a greater contribution to the overall welfare and well-being of society. More on Stages of Personal Growth. A way of life that has the only reference to the awakened Spirit inside. Spirit is the substance of which the entire world or the universe is made. It is Self in transcendence, Soul in the cosmos, being in any person or object. It is dormant and buried in man. It seldom awakes in Man. Descent of grace awakens it. Man awakens to the inner Spirit when grace descends from above, when, for a split second, he is ushered into the plane of Timelessness. Sri Aurobindo calls it grace of Spirit when the inner spirit, awakes by itself to peep into surface. The grace from above is always present in the atmosphere. It is a moment of spiritual evolution when the inner Spirit surfaces all by its own choice. An observation of life, an analysis of events in all planes of its existence is a sine qua non for one who endeavours to lay his hands on Life's laws. The clue, the key, lies in those SUBTLE points where energy spills over from one field to another, often appearing to be an unconnected vagary, occasionally contradicting the laws. To see such points of contradiction as confirmation is the index for complete understanding. A further point, maybe the most important one, is to render this knowledge useful for evoking life response or to make Life Respond as we intend. Should we do so, he who does it gains mastery over life. Explore the character and laws of life as they express in history, biography, literature, contemporary events, and personal experience, and the means by which human beings can make life respond for greater accomplishment and fulfillment.